LYASI Knife Block made of durable eco-friendly sustainable bamboo,no taste and mould resistant!Safe to use and easy to clean.Powerful permanent magnets and 360 rotating design can ensure hold many different styles of knives,perfect for mixing and matching various sets of knives with easy 360 access,showcases the blade for easy identification,aluminum alloy base and non-slip mat ensure that the magnetic will remain stable under all conditions. It is a unique knife block to both creatively showcase your knife collection, and gives you an unparalleled ease of use.It can save you many time and space.Just "Add to Cart",enjoy your pleasant cooking now! Luxury LYASI knife block handicraft for family, friends neighbors and acquaintances on wedding,housewarming gift,anniversary and Christmas gifts.With the LYASI knife block,your children, family members and friends must love it such an exquisite and amazing gift. we can provide you one year warranty and 30 days satisfaction guarantee!you can be absolutely assured of our items. Note:LYASI knife block does NOT include knifes. 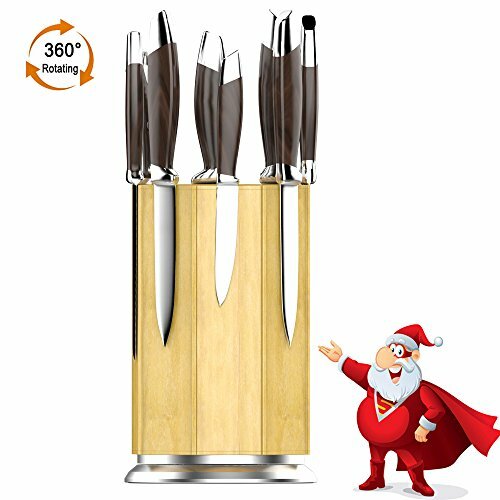 【360°ROTATING KNIFE BLOCK】An ergonomically pivoting design that enables you to have a 360° of control of your knifes,you can get the correct knife immediately.Aluminum alloy base make more stable. 【POWERFUL PERMANENT MAGNETS】Made in Strategically embedded neodymium hidden magnets,and each 360 Knife Block has the sealed precision bearings for a smooth pivoting action that rotates to deliver your knife the fastest way possible.Never fall off! 【100% NATURAL BAMBOO】Made of durable eco-friendly sustainable bamboo,smooth surface and green health.By fine grinding and more thick material,make your kitchen more secure. 【LUXURY GIFT BOX PACKAGING】Best gift for family, friends neighbors and acquaintances on wedding,housewarming gift, anniversary and Christmas gifts.etc. If you have any questions about this product by LYASI, contact us by completing and submitting the form below. If you are looking for a specif part number, please include it with your message.